The Walled Garden within Carnfunnock Country Park is a licensed outdoor wedding / civil partnership venue and a set fee applies for this purpose. 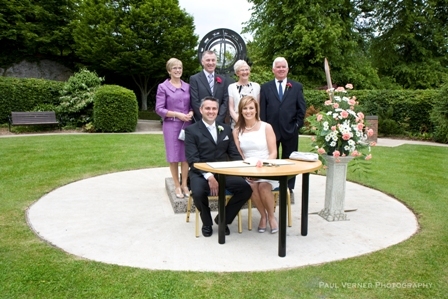 Our first wedding service was held on Friday 11 June 2010 within the Time Garden of the Walled Garden. The happy couple were Angeline King and Liam Kelly who said "It truly is an asset to Larne to have such a beautiful location for a wedding. The bride added that "It is ideal for someone like me who wanted to keep things minimalist, laid back and have as little fuss as possible." If you are interested in having a service within Carnfunnock Country Park please contact a member of the Registration Service for the Larne area on T: 028 2826 2385. We do not charge for having your photographs taken within our Walled Garden or elsewhere in the Park. However normal parking charges will apply as per our pricing policy. We advise you to pay for your parking in advance to save any undue embarrassment and your party will then be permitted access to the Park on the day. If you are interested in booking please notify our Visitor Centre staff with the following: date and time required, photographer's name, couples names and contact details. Please note: it is essential to obtain permission before photography will be allowed. Use of the Walled Garden is not exclusive - it will remain open to the general public whilst photography is taking place. Additionally more than one wedding / civil partnership party is permitted at a time. Q. How much does it cost for the use of the Walled Garden at Carnfunnock? A. The fee is £200 which covers the cost of setting up the venue with chairs and a table and providing security backup while your ceremony is in progress. A small silk flower arrangement for the table and a larger silk flower arrangement are also provided, or if you wish you can bring your own flowers. This will be invoiced directly by Mid and East Antrim Borough Council in advance of your ceremony. Q. How much is the fee for a ceremony within the Walled Garden at Carnfunnock? A. Please contact the Registrar directly for details or click here to refer to the Registration section on the Mid and East Antrim Borough Council website. Q. Can we have our ceremony on a Bank Holiday? A. Unfortunately not. The Country Park is extremely busy on Bank Holidays and it would not be possible to hold a ceremony then. Q. Can we have our ceremony on a Sunday? A. No. Mid and East Antrim Borough Council has given the directive that ceremonies should only be held Monday - Friday 10.00am to 5.00pm and Saturday between 10.00am and 3.00pm. Q. Who will be performing the ceremony? A. A member of staff from the registration service of Mid and East Antrim Borough Council. Q. Can we have music at our ceremony? A. Yes, if you have a battery operated portable CD player you can have someone operate this, or if you prefer you can have your own musicians. Q. What are the seating arrangements? A. If you are having your ceremony in the amphitheatre there are seats provided for all the guests. If your ceremony is in the Time Garden then seats will only be provided for the ceremony principals for signing of the Schedule. As this is an outside venue, the seats are sturdy stacking chairs, there is no limit to the amount of seats that can be provided. Q. Will the Walled Garden be closed to the public during our ceremony? A. No, the Garden will not be closed, but there is plenty of room and any members of the public that are around should not create any problems. Security will be in attendance to ensure that members of the public do not disturb the proceedings. A. There is a sail shade in the amphitheatre part of the Walled Garden, which gives some degree of protection. The sail shade will handle very light showers but is not waterproof so if the weather was very bad, then all guests must be advised to bring umbrellas. A gazebo can also be erected over the Registrar and couple for the ceremony. Q. Do our guests have to pay car parking charges? A. Any guests wishing to park their car will need to show their wedding invitation to gain free access to the Country Park. Q. How do I arrange a ceremony within the Walled Garden at Carnfunnock? A. Please contact the Registrar’s Office on T: 028 2826 2385 or E: registrar.larne@midandeastantrim.gov.uk to make the initial booking. The Registrar will check with Carnfunnock regarding availability and get back to you. Q. Are there any other venues within the Larne area that a Wedding/Civil Partnership can be held?